Here’s another hole in Tumblr and I hope they can figure out how to solve this permanently (just kidding). Until that time will come let’s feast on free Premium Tumblr themes. 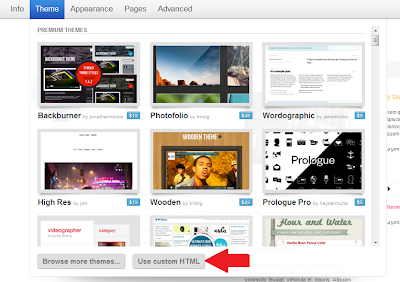 This is a small hack on how to get the codes of Premium Tumblr themes. Go to the Tumblr theme garden at http://www.tumblr.com/themes/premium, if it will not open directly on premium theme, just select “PREMIUM” tab. Now choose the theme you want to get and click it. I choose "Space Traveler" theme and the theme number is 30506 (this number is different depending on your chosen theme). Now go to http://www.tumblr.com/customize/theme_code/xxxxxx and replace the xxxxxx with your theme number, on my case it is 30506 for Blank Slate theme. Right click and press "view page source"
Login to your Tumblr account and customize it. Paste the code in “USE CUSTOM HTML” and were done. Don’t try to get the codes and sell it to somebody, that is really bad. And don't forget to visit wakamakulit.tk. He has some pretty neat hacks for tumblr. i dont think there is another way. try another theme? Yeahhh!! !the most helfull and quick advicee!! !Anyone who wrote this is the best hacker!! @Elenica this isn't considered "hacking"
I agree. Its just using what you dont know about. Clearly, you must also see using another person facebook account while they are gone is considered "hacking" while it is merely, ignorance. it says request has been denied (when I go to the URL), So I can't even get to the View source code part or whatever. do you have all the theme code on your collection? can you share it? If you believe this was in error, please contact support. PLEASE COME UP WITH SOMETHING ELSE IM DIEING. why can I go to http://www.tumblr.com/customize/theme_code/xxxxxx?? You guys, by copying the source code, we will be unable to edit the content of it by the customize tab, you have to edit the HTML code. So the suckers that can't do that, will be screwed. Very good and new Tumblr themes. Tumblr fixed this "hack" quick. *700# mobilink what is Meant By This Key? And what is the purpose of *700# Mobilink Key? Awesome post about tumblr themes. This is really cool writing about using tumblr theme. I appreciate your writing about tumblr themes. Awesome post about tumblr themes. Thanks for nice post. Really awesome collection of Tumblr Theme. This theme collection will help anyone finding best tumblr theme 2017.